Sounds to me like you have a perfectly good set of pads (or two) with some bad elastic straps. Why not look up a local seamst(er/ress)? I can't imagine it will cost that much for what is probably at most 30 minutes of work, and someone who works in that profession might have some insights on a better elastic that will last for you. Plus then you can feel good about supporting local business and reducing your waste footprint if you care about those things. Maybe. The outside covering also tears on the Lizard Skins so fixing them is more involved then simply replacing a couple of straps. It would require substantial new material they may not be readily available and more robust stitching than they are likely accustomed to doing. I've had a leather repair shop make additions to my boots and a luggage repair shop fix the velcro on my wrist guards. In both cases, the results were functional but not quite right. Even when skilled at similar looking operations, you can't expect perfect results if they are not familiar with the application. Unless your idea is to hit the pads and immediately roll, I don't think these will work for speed. The plastic cap is what gives a knee pad a low friction sliding surface needed to skid to stop without transmitting forward momentum to the knee. Without it the pad will dig in and probably slide off no matter how tightly strapped on. Either that or the straps themselves dig in and cut the skin. Capless knee pads are meant for aggressive skating where thye are worn underneath baggy jeans. The cap wouldn't work anyway because it would not be in direct contact with the ground. Interesting. Did you do any high speed crashes? "During a failed attempt to hold out a slide, our rider highsided and fell directly onto the kneepads down a steep hill. In this instance, the pads held on for a second or so, but soon afterwards the right pad was pulled off of our riders knee, exposing it to the pavement, which resulted in a bloody knee. The material simply had too much friction with the ground to stay on, which makes sense, since Poron XRD is urethane, regardless of how smart it is." not true. there are some ballistic fabrics designed to be able to slide on pavement and concrete. Even with light weight pads, most of the bulk and weight is the foam padding, not the plastic shell. 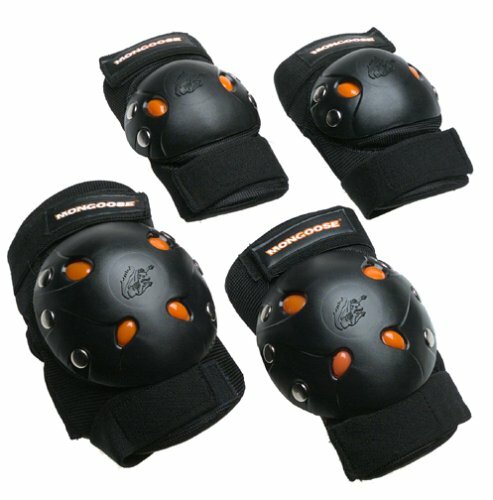 The design of lightweight, low bulk, knee pads is a solved problem and has been for many years. It just isn't generally available. 1) A shell curved to accommodate the anatomy of the knee and give it freedom of movement. 2) A ridge in the foam just above the knee cap to prevent sliding. 3) Adequate range of sizes so that reasonable fit can be achieved. 4) An elastic but not excessively stretchy top strap. 5) A non-stretch bottom strap. Lizard Skins Softcell Knee pads rock #1 and #2. Very light and non-restrictive. They do not slide off. However, they were only ever available in two sizes and the straps stretch out much too quickly. Hmm. Now that I think of it, I wonder how difficult it would be to transplant a Lizard Skins cap onto Triple-8 backing? I can offer some very sound advice, straight from NASA on selecting the best design style for pads in so far as how the style of pads that use velcro cinch straps will work best. A while back NASA was embarking on a project to produce the next generation astronaut space suit. One of the biggest areas needing improvement was concerned with excess stiffness at many joint flex zones of the suit, especially the hands and finger joints. How long astronauts could work effectively during space walks was being limited by the amount of muscle fatigue they had to tolerate from the suit pressure causing so much joint flex resistance. NASA created a competition, with $500K prize I believe, for inventors and companies to submit breakthrough design schemes that would give dramatic reduction in muscle force needed to work key suit and glove joints. Even with big corporations having large budgets participating, the prize ended up being won by a lone individual inventor working out of his garage. He came up with a winning glove concept that reduced the force needed to work the finger joints by ~50%. The key breakthrough was to have every joint use two suit fabric tension strips always forming an X crossing on the inside of every knuckle and other bending joint. Makes perfect sense once you see it in action. I had various protective skate gear sets where the knee and elbow pads each used a pair (upper & lower) velcro cinch straps to tighten the pads in position over the knees and elbows. Unfortunately, they were always sliding out of position as I skated. I tried switching the way the straps were routed so that they formed an X behind the knees and inside the elbows. Amazingly, the crossing X pattern worked so much better I couldn't believe it. If the pads started shifting off the optimum desired location, subsequent joint flexing tended to pull them back to where they should be. This worked well for both the elastic and non-elastic style cinch straps. Because I don't have to pull them as tightly now, the elastic ones last a lot longer from being less stretched too. Now I only buy knee and elbow pads that use this style velcro cinch straps, and with straps that have enough length to be re-routed in the crossing X path arrangement. I do not have to make them so tight either, yet they still hold position so well I rarely ever have to think about that anymore.